← Is there a convenient way to save EMF to PCX, please? 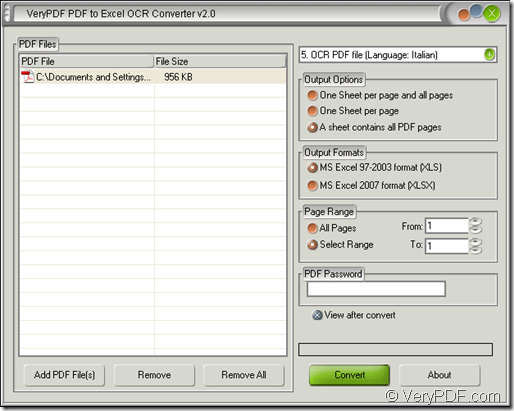 Please download the application VeryPDF PDF to Excel OCR Converter at its homepage to your computer because you will use this application to convert scanned PDF to Excel. With the OCR tech, the application can accurately extract the characters in your Italian PDF document easily and quickly. After you get the setup file of the application, please double click it and follow the installation wizard coming out on your screen until you complete the whole procedure. If necessary, you can create a desktop icon for you to conveniently launch PDF to Excel OCR Converter. 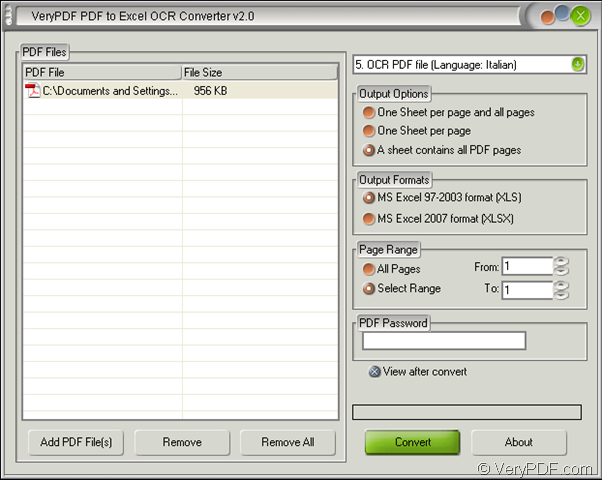 In the conversion from scanned PDF to Excel OCR Converter, the first thing you need to do is open the application. As mentioned above, if you have created an icon for the application, you can double click it or right click it and click “Open” option to open the application. Or you need to click “Start”—“All Programs”—“VeryPDF PDF to Excel OCR Converter v2.0”—“VeryPDF PDF to Excel OCR Converter v2.0” The opened window of the application will appear on your screen then. Please see it in Figure 1. An advantage of the application PDF to Excel OCR Converter is that you can choose “Adding document first” or “Setting parameters first”, which is not strictly limited. For example, if you want to set parameters for the target file before adding PDF documents, you can do as follows. Firstly, please choose the fifth option in top right dropdown list—OCR PDF file (Language: Italian). Secondly, you can select one kind of output layout for the target file in “Output Options” group box. Thirdly, please choose an output format for the target file as “XLS” or “XLSX” in “Output Formats” group box. Fourthly, you can set page range for the scanned PDF document according to your needs. Now you need to add scanned PDF document into the application. The most convenient way is to directly drag the PDF document and drop it into file list of the application. Or you can click “Add PDF File (s)” button to open “PDF to Excel” window from which you can select the document to be converted. Of course the second and the third step can be interchanged. 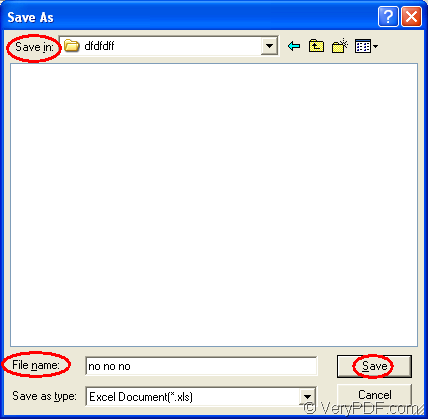 The last step is to save the target file by clicking “Convert” button to open “Save as” dialog box which is shown in Figure 2. 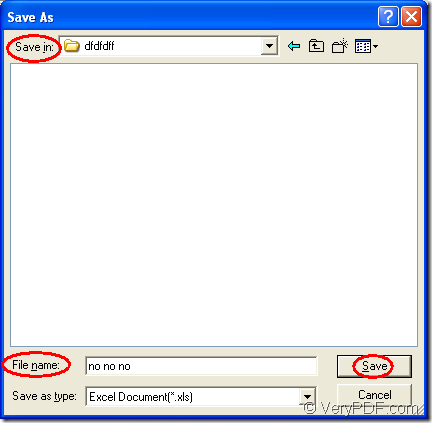 In “Save in” dropdown list, please specify the output location for the target file. In “File name” edit box, please input the name of the target file. Then please click “Save” button to run the conversion from scanned PDF to Excel. So it is the end of the conversion. You are strongly recommended to download the free trial version PDF to Excel OCR Converter to make the conversion yourself. Only by this way, you can master the application quickly. How to merge PDF and convert PDF to text by one software? This entry was posted in OCR Products and tagged Italian PDF, scanned PDF to Excel. Bookmark the permalink.